Western Digital (NASDAQ:WDC) is a name you've probably heard of -- it's one of the two largest makers of hard disk drives and also a fairly substantial player in the world of flash-based products. Cypress Semiconductor (NASDAQ:CY) is a smaller, likely lesser-known name. It primarily builds a range of chips that target Internet of Things (IoT) and automotive applications. So which of these two stocks is the better buy? Let's take a closer look at how these companies stack up. According to analyst estimates, Western Digital is set to see its revenue plunge 19.4% during its fiscal 2019 followed by a 1.3% drop in the subsequent year. Earnings per share (EPS) is expected to drop from $14.73 to $5.52 in the current year and then fall further to $5.29 in fiscal 2020. Western Digital's financial performance is set to take such a beating because it has heavy exposure to the NAND flash memory market. When that market was booming, NAND flash prices (and, by extension, the prices of the products based on that technology) were on the rise, translating into fat profits for the company and its peers. Now that NAND flash prices are plummeting -- much to the chagrin of memory makers worldwide -- Western Digital's profitability is suffering immensely. Cypress mainly deals in specialized chips, not commodity memory chips. (Cypress recently divested itself of its NAND flash business and sells a more specialized type of memory, known as NOR flash.) What this means is that the sales and profitability of its products tend to be far less volatile than those of a commodity memory chip maker. While Cypress is set to see its revenue fall in its fiscal 2019, that decline is due significantly to the divestiture of the company's NAND business, which creates a tough year-over-year comparison. In the subsequent year, Cypress is expected to grow revenue by 5.5%. The company's EPS looks set to dip in fiscal 2019 to $1.09 from $1.36 in the previous year before rising to $1.22 in fiscal 2020. As far as near-term growth prospects go, Cypress Semiconductor looks like the winner. As far as growth over a longer period of time goes, Cypress' goal of a 7%-9% compound annual revenue growth seems reasonable and achievable. Western Digital, on the other hand, could potentially see years with much higher growth than that followed by years of gut-wrenching declines due to the nature of the memory market. I'm going to hand this round to Cypress, as its growth should be more steady and predictable than Western Digital's. Check out the latest earnings call transcripts for Western Digital and Cypress Semiconductor. Both Western Digital and Cypress Semiconductor pay dividends and neither has increased their respective dividend in a while. CY Dividend data by YCharts. With that being said, Western Digital is the clear winner in the dividend showdown. At the current share price, Western Digital's dividend yield is a generous 4.16%. Cypress' is still respectable at a 2.87% yield, but the difference is too large to ignore. Both Western Digital and Cypress are fairly cheap stocks. The former trades at just shy of 8.8 times fiscal 2019 EPS estimates and about 9.2 times fiscal 2020 EPS estimates. Cypress is pricier, trading at roughly 14.1 times fiscal 2019 EPS estimates and about 12.6 times fiscal 2020 EPS estimates. With that in mind, even though Western Digital is cheaper by a fair amount, Cypress' more straightforward growth prospects coupled with an inherently more predictable business overall is certainly something that some investors would be more than happy to pay a premium for. And Cypress stock is, on an absolute basis, still pretty cheap. If I had to choose one of these two stocks to add to my portfolio, I'd go with Cypress Semiconductor. 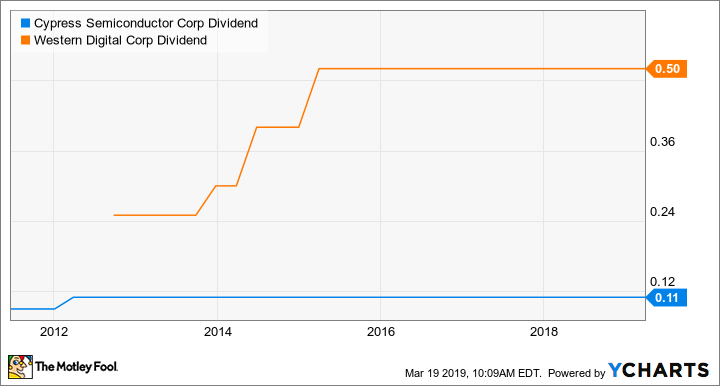 Western Digital's bigger dividend is nice and the stock is quite cheap, but I can more easily envision where Cypress' business is going to be over the next five years than I can Western Digital's. That clarity is important to me and it's something I'm willing to pay a premium for, but, of course, your perspective may be different.